"You are the heroes who must remember this day even though most of you weren't even alive yet when it happened," said U.S. Army Capt. Rich Jenkins who now serves at the American Legion Commander. "Never forget this day and what it meant to our country." He said the patriotism and togetherness the country felt immediately after the attacks were undeniable and the resolve of the country remarkable. But he said mostly he wanted everyone to remember and learn from 9-11 so nothing like it ever happens again. 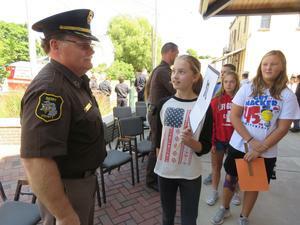 "Let me die an ugly old man without ever having to scratch another name in that wall," he said pointing to the Middleville Veteran's Memorial behind him. 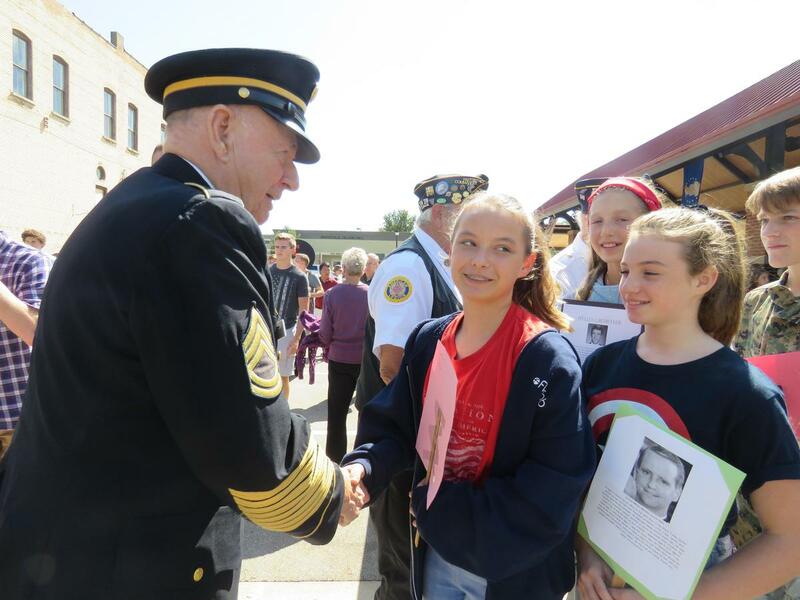 Keynote speaker U.S. Navy veteran Bob Bender also challenged the students not only to never forget 9-11, but also to never forget what makes America great. That, he said, is service to others before self even in the face of danger like the firefighters who rushed into burning buildings to save others. Bender struggled to control his emotions as he spoke to the guests gathered as he talked about those selfless acts. "A quote from President George W. Bush says that 'no definition of a successful life can do anything but include serving others,'" said Bender. His challenge was for students to give back, help others and make some kind of service to others part of their lives. That most tragic day in American history, now 17 years ago, happened before most of the TK students were even born. After listening to the voices of the speakers crack and watching them choke back emotions, students said the impact of 9-11 on the community became much more real. TKHS student Megan Chinavare said she will never forget 9-11 and being at the Middleville ceremony. "It was humbling and profound. I didn't realize the deep impact it had on people here." 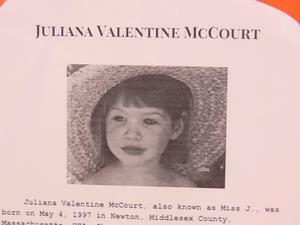 Classmate Julia Curtis said she didn't realize the impact 9-11 had on the local community. "It was really cool to see the community come together for that ceremony. It's something I'll never forget." 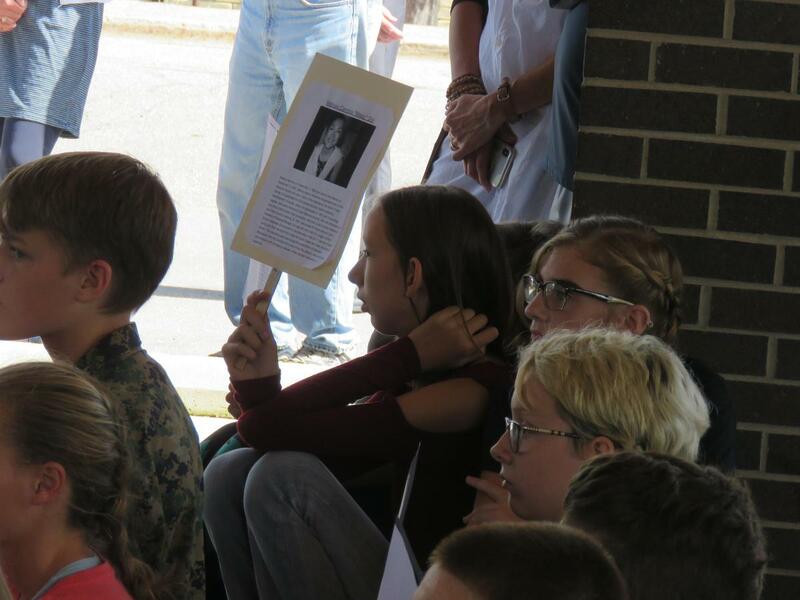 High school student Hanna Hollis shared how 9-11 impacted her life. Her older brother decided to join the service shortly after the attacks. She said she was proud of him for what his courage, sacrifice and commitment and for what he's done for the country. As she was giving her remarks, a single plane flew over the Middleville ceremony site. "It just gave me chills," said high school student Sierra Jahnke. She said the ceremony is something she will never forget. "It made me feel really proud and really heartbroken at the same time," said Jahnke. A group of 25 eighth -grade students earned the right to attend the ceremony by completing a voluntary assignment. They each researched victims of 9-11 and wrote a paper about one victim. 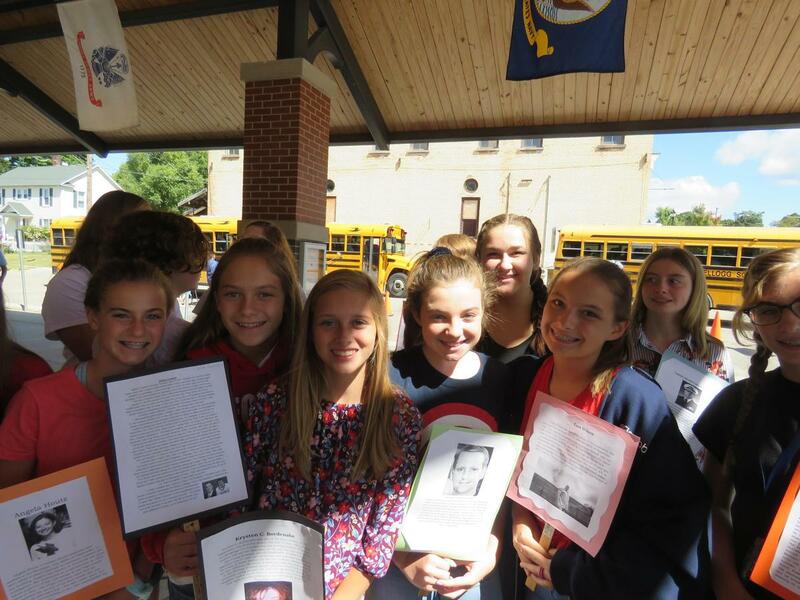 The faces of those victims and their stories were then brought to the ceremony, held up on cards by the students as the story of 9-11 was relived. 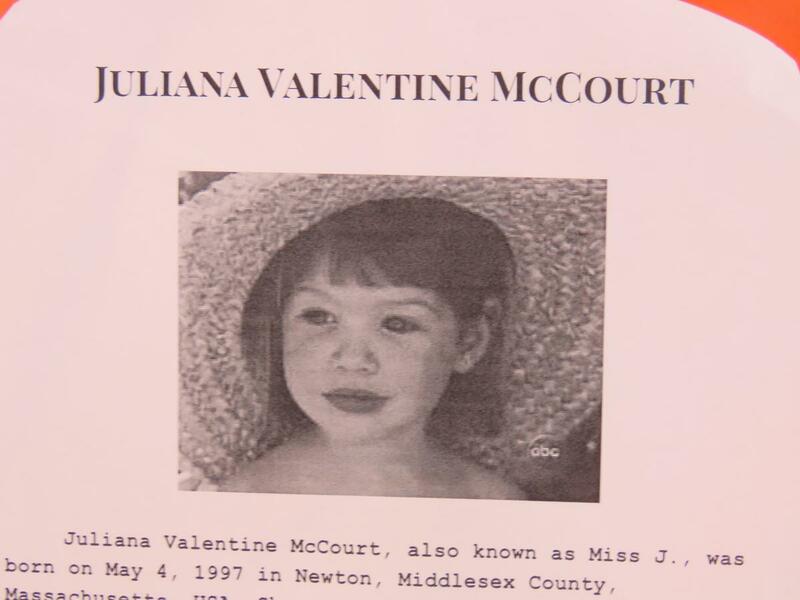 Social studies teacher Rojean Sprague said the project puts real names, faces and stories to the victims. High school choir members sang a moving song to honor the victims. The band played the National Anthem, and "God Bless America" along with a moving echo of "Taps" as wreaths were laid. 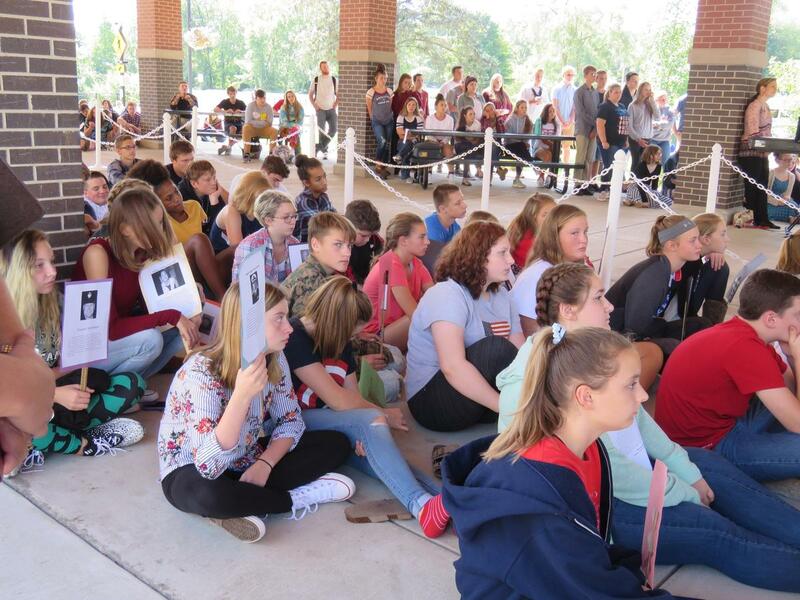 While students realized 9-11 was a horrible day in American history, they also realized how the events made the country come together like never before. "9-11 was so awful, but it made America stronger and it made strangers feel like friends," said Jahnke. Middleville veteran Charlie Pullen put it simply. "No veteran should ever die alone and this day should never be forgotten. Please remember this day and pass it on for all time."